The holidays are just around the corner, and if your friends and family are cannabis connoisseurs like yourself, you may be looking at ways to infuse your feast. If so, you will be happy to know that there are many different ways that you can incorporate cannabis into your Danksgiving festivities. Not only are these tips and tricks for infusion great for the holiday season they will work with almost any food all the year through. One of the most common ways of infusing foods is simply substituting butter for cannabis-infused butter or adding it to the recipe. Making cannabis-infused butter is simple to do at home. If you are not familiar with the process, you can check out a quick method that requires no special tools here. 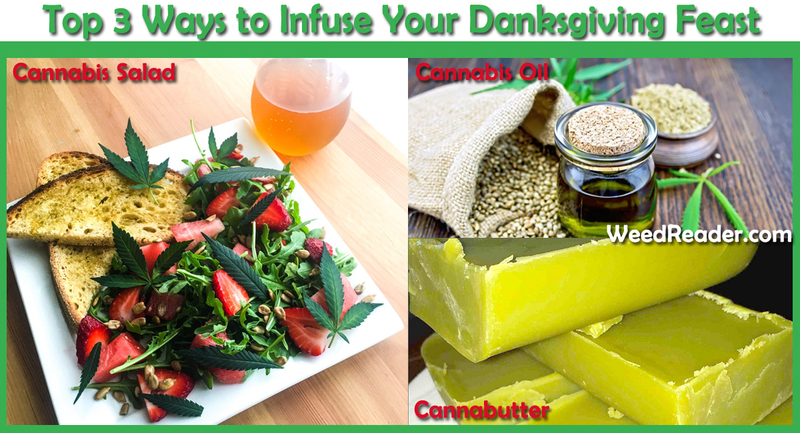 With cannabutter on hand infusing your holiday meal is easier than ever. Just add some to your mashed potatoes instead of regular butter, top off your sweet potatoes with cannabis-infused butter, or you can even pack the inside of the skin of your turkey with cannabis-infused butter and allow it to soak into the meat while cooking. If the recipe calls for butter, you can just replace it with cannabutter for an easy cannabis-infused danksgiving meal. Just like butter, there are many recipes that we love to enjoy around the holiday seasons that call for oil. Whether is oil to sauté something or oil in a recipe for your favorite dessert if you have cannabis infused coconut oil or extra virgin olive oil on hand you can just substitute your canna oil instead of using plain boring oil! Some of my favorite ways to use this method of infusion is to use canna oil in my turtle brownie recipe and basting the turkey throughout its cooking cycle. If you’re not sure how to make cannabis oil to use in recipes check out the guide here. Of course, there is always the method of merely adding fresh bud to your recipes. While this isn’t going to create the best texture in many foods if you are having a salad pre-dinner aside from the salad in your bowl to toke adding fresh cannabis leaves or decarbed cannabis buds ground up with perhaps some extra virgin olive oil drizzled on top would make a great addition. Be sure that your cannabis is decarbed however otherwise the individual enjoying the salad isn’t going to get the effects they might expect! To learn more about decarbing check out this article! These are just three simple ways to infuse the feast. Do you have a favorite way to infuse your holiday dinners or foods throughout the year? Do you have tools or products that you can’t live without when it comes to infusion? If so, let us know in the comments below!